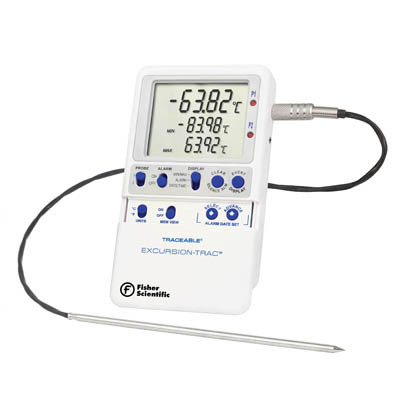 Fisher Scientific™ Traceable™ Excursion-Trac™ Datalogging Thermometers are ideal for monitoring temperatures in refrigerators, freezers, water baths, heating blocks, and incubators. With user-defined time intervals. High-accuracy thermometer has a temperature range of -90 to 105°C and resolution of 0.01 and maintains an accuracy of ±0.25°C across the entire temperature range.